Good news for any business using the ERA platform to manage its compliance tasks: ERA has unveiled the brand new free Compliance app for iOS and Android devices. Now you can browse, track, and complete any compliance task set up in your ERA-EMS platform directly from your mobile device. Simply bring up your to-do list, select a task, and complete it on the go. Discover upcoming tasks to ensure deadlines are getting met, and complete overdue tasks quickly. Whether it’s a permit renewal, a training event, an air emissions report, a safety inspection, or any other task that keeps your business in compliance and productive, this simple and user-friendly app lets you complete tasks and manage workflows as you move around your facility. The app uses your existing ERA-EMS login information and access permissions, so there’s no need for extra setups or to remember multiple passwords. From the field to the shop floor to the office, the ERA Compliance app offers a simple yet innovative solution to manage and complete your compliance tasks on the go. The Compliance app is free, and available on both iOS and Android devices. Please note that you must already have a login for the corresponding ERA-EMS module for the app to work. Download it today and put compliance management in the palm of your hands. 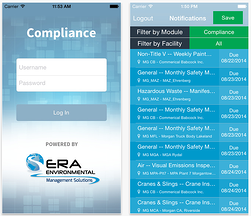 See also the SDS Finder app from ERA Environmental - a free app for on-site SDS Management.